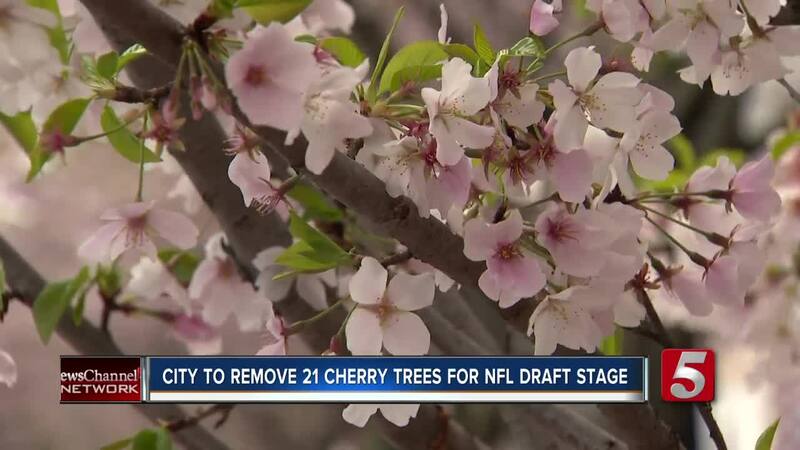 The mayor has said there will be a change of plans after it was announced on Saturday that 21 mature cherry trees located near downtown Nashville were to be removed in order to make way for a stage that will be used during the NFL draft. NASHVILLE, Tenn. (WTVF) — This story has been updated. Read More Here. More changes have occurred regarding the plans to move 21 mature cherry blossom trees from Riverfront Park to make room for an NFL Draft stage. It was announced on Sunday that only 10 trees located behind the roundabout will be moved. This announcement comes after the mayor said there would be a change regarding removal of the cherry blossom trees located near downtown Nashville. The trees are located on public land, more specifically they line 1st Avenue along the downtown Riverfront Park. Vice Mayor Jim Shulman confirmed that the chopping down of these trees was originally scheduled and that the plan was for the trees to be mulched and relocated to line paths in other parks. This news, however, caused quite a bit of commotion in Nashville, with many stepping forward in their defense. "After hearing the public response over the planned cutting of 21 of the 68 ornamental cherry trees at Riverfront Park, I informed the NFL and Nashville Convention and Visitors Corp. (NCVC) that they will have to remove [the trees] intact and replant them in our city. If any are found to be diseased or near death when removed, they will be replaced with new, healthy trees. The NCVC and NFL will replace the removed trees with 21 new ones, and will also plant 17 more at Riverfront Park in previously vacant and new locations. The NCVC will pay for the relocation and for any sidewalk damage. The NCVC and NFL have also agreed to plant an additional 200 cherry trees – for a total of 238 cherry trees planted – across the city at fire halls, libraries, parks and in other places to continue to honor our relationship with Japan and long-time partnership with the Cherry Blossom Festival." All 21 trees were set to be taken down at 9 a.m. om Monday, April 1. This is no longer the plan. Orginally Mayor David Briley's office said ultimately, Metro had to weigh the decision to save these 21 trees against the economic impact of the event, the size of which makes it necessary to build the 400-foot stage and other structures in question. "It seems incredibly short-sighted to cut down trees that took 15+ years to grow for the convenience of a one-time, 48-hour event. I understand that the NFL is willing to make a relatively small financial contribution towards replacement trees, but the environmental and health impacts of a mature tree far exceeds that of a newly planted one. It will take decades to truly replace the benefits of the trees scheduled for removal." This news also comes just two weeks before Nashville's annual Cherry Blossom Festival which is set to be held at the Public Square and along Riverfront Park where the trees are located. A petition has already been put online in order to push back against the removal of the cherry blossom trees. Butch Spyridon, president and CEO of the Nashville Convention and Visitor Corp, conveyed that he was in support of the plan to remove the trees. In a statement release, Spyridon said, "Metro Parks staff evaluated and approved. Trees that can be replanted will be. Both the NFL and the NCVC have further committed to donate an additional 100 cherry trees each (200 total) to Metro Parks for the cherry blossom program. Those trees should be planted and blooming by spring of 2020." The Nashville Convention and Visitors Bureau will also be donating an additional 12 trees to be planted. That will bring the total number of trees being replanted to 38. The NFL draft is set to take place April 25-27 in Nashville.